Is running a journal becoming too much of a drag? Just get help from a new organization that is trying to make an offer that journals can’t refuse. 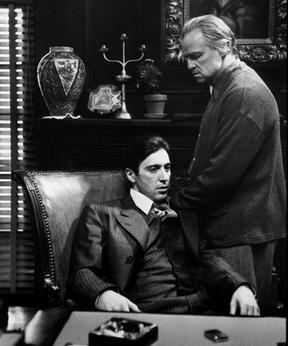 On a website splashed with pictures that connote classic mob movies (Marlon Brando as The Godfather, Al Pacino, cigars), a new service called “Journals Mafia” tries to convince journals to partner with them, or even sell the publication outright. We work with a huge amount of articles. We work not only with people who need a publication. We also work with the universities and scientific organizations, which give us from 10 to 100 articles…. My goal is to monopolize publication market of Russia, Kazakhstan and Azerbaijan. The general response from most (COPE Council members and Publishers) has been this is so over the top that it’s difficult to believe it isn’t a hoax of some kind. It seems so obviously unethical that it’s hard to believe anyone would fall into the trap of engaging. We have not seen anything quite this blatant, although many editors have passed along similar emails offering elaborate schemes to pay bribes for publishing without the associated website details. We have already published more than 1000 articles in Scopus and [Web of Science] journals, so we know the whole process. We have a great experience in this field…We can provide the articles together with the remarks of our [reviewers]. Formal double-blind review is guaranteed. Everything is usual for you, but less work and much money. The organization’s business plan depends on the rank of the journal. We put 1 article from our region for one issue. one is from Russia, one – from Azerbaijan, one – from China, one – from Kazakhstan, etc. This will not cause any suspicion. If we do not want to attract attention, to work for years and to raise the journal’s ranking, then we send from 1 to 15 articles for one issue (no more than three articles from one country). All the articles should undergo the review stage. We have our own team of reviewers (more than 100 reviewers from around the world). We can review the articles by our reviewers. We correct and edit the article taking into the account the reviewers’ comments and remarks. The general response from publishers has been they are aware and have notified staff and external or handling editors that this is not acceptable. Some have said they have spam filters or systems in place that have caught the emails before they reached editors. We hope that the education efforts of COPE have raised awareness of unethical practices so that editors do not think they should respond to an email like this, despite the obvious work that went into producing the website and obtaining names and email addresses of editors and editorial staff. This sounds like collusion to me. Get Mueller on this right away. How can I work for you and earn? I am specialized in the field of Electrical and Electronics Engineering and a Reviewer too.